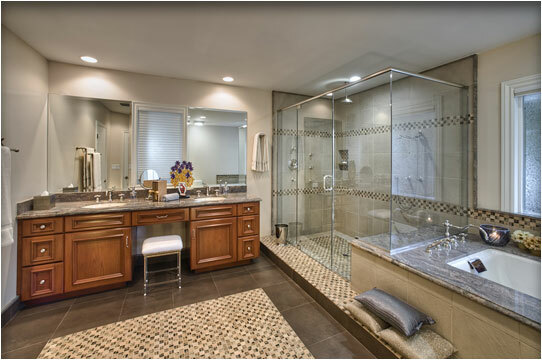 Latest Design Option 5-1, Master Bathroom » Roger Perron Inc. Here we have a master bathroom, a part of the master suite addition, providing elegant living with ample space for everything one would need. The spacious shower and seat for two is an extension of the granite that surrounds the tub. The use of tile and granite along with mosaic tiles creates a very appealing combination. Design for this remodel and addition with luxury floor plan in Encino was created by Roger Perron, design-build general contractor, with contributing architect for working drawings Curt Sturgill.